You Want Me To Put It Where???? 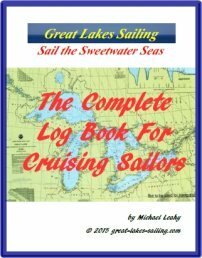 Many sailors can comfortably cruise in all weather anywhere on the Great Lakes but still get that knot in their stomach when contemplating docking a boat, especially in gusty weather. Leaving a dock or returning home can be an excellent display of good seamanship. Or it can turn out to be catastrophe. And, ever notice that when you have difficulty docking a boat, that’s when it seems everyone in the club or marina is there watching you! (I'm not sure which is worse – manhandling the boat to the dock or knowing that someone is sitting there tut-tutting into their beer glass!) So, with those thoughts in mind, lets look at the docking process and the forces at work. The end result should be some simple steps that will make for smooth docking. Abraham Lincoln once said 'If I had 60 minutes to chop down a tree, I'd spend 59 sharpening my axe' – in other words, PREPARE. Planning is vital. Rushing at a task without planning each step AND having a Plan B (or Plan C) is sure to result in mistakes or worse. The other watchword is SLOW. I have often thought that there should be a throttle selection called 'creep'. Nothing will get you into trouble faster when docking than too much speed. There are a couple of points to mention before getting into the details of manoeuvring. The first is 'pivot point'. This is the point of the axis around which a boat will rotate and it is located about 1/3 of the boat's length aft the bow. This is where the mast on a sailboat is usually stepped and where the helm station on power boats is usually located. A consequence of this is that the stern swings when the boat turns. This is important when leaving a dock because the bow will turn away slower than the stern will swing and without care, the stern will collide with the dock. Conversely, when the boat in in reverse, the pivot point is about 1/3 of the length forward from the stern. Generally, the pivot point when in reverse is near the wheel pedestal. This means that turning while in reverse will cause the bow to swing much faster than the stern. In tight spaces, turn the rudder first then apply power. The prop-wash from the propeller deflects off the angled rudder and turns the boat in a smaller space. This 'Steer before Gear' results in a smaller turning circle as the boat will begin to turn before moving forward. The second factor to be aware of is 'prop walk'. When viewed from astern, most propellers turn to the right. Water near the hull is slightly less dense than water further below. Therefore the propeller has a tendency to move sideways as it turns. In forward gear, this action is easily corrected by slight adjustments to the rudder as there is a significant amount of water passing over the rudder. However, in reverse, there is no water from the propeller passing over the rudder and therefore that 'walking' effect is much harder to neutralize. For a right hand propeller, in forward, prop walk is to starboard. In reverse, prop walk is to port (reverse these for a left hand propeller). Each boat will react differently and its important to take some time to learn how your particular boat reacts at various speeds in both forward and reverse. Everything begins with preparation. In the Canadian Coast Guard Auxiliary, we refer to a SAPP Point – Stop Assess Plan Proceed – a point where you physically and consciously stop and plan your next steps. Well before you approach dock, several things need to be done. Rig fenders on both sides – if you lose power, you don't know which side you will end up having against the dock. Preparations include deciding which side you are going to dock on and a complete assessment of environmental factors – the direction and speed of applicable wind or current. Visualize the entire process. Go through each step and analyze/assess to identify things that could go wrong – and develop a plan to deal with those. Once you have a plan in place, develop an alternative Plan B – you just may need it. Have a predetermined escape route if everything goes sideways. Once this is done, brief your crew, communicating the details of your plan. Give explicit directions to crew as to what you want them to do or not do. And part of that process is them repeating back to you the instruction(s) you have given. Also, develop some agreed-upon signals to use. This eliminates yelling and quiet communications instill confidence and keep stress levels down. Also, for me, I insist that anyone who works on the foredeck wears a life jacket – and I wear one as well. Having been involved in rescues and recovery searches, I am all too aware of just how easy it is to go overboard and the possibly dreadful consequences. Of all instructions, this one is vital. Never under any circumstances ever is a crew member to use a body part to fend off the boat. NEVER. In one instance in a marina on Lake Erie, I saw a woman put her leg out to slow the approach of the boat to the dock. The crack of her leg breaking echoed down the slips. In another instance, I was in the wheelhouse of a boat when a person suddenly stuck his foot out as the boat approached dock. Before I could even draw a breath, his foot slipped and was crushed between the hull and the dock. Fiberglass can be fixed like new – not so crushed body parts. Once the preparations are complete, its time to execute. Here, the watchword is SLOW. You obviously need way on to have steerage-way. If at all possible, and you have a right hand propeller, as most do, approach with the dock on your port side. This takes advantage of the prop walk. Approach the dock slowly on an angle of between 15-30 degrees. Pick a point along the dock where you want the bow to end up – frequently, thats a cleat. Aim for a spot about 1/2 your boat length aft of that point. Approach to within 2-3 feet/ .5 -1 m. Slip the engine into reverse and the prop walk will start to bring your stern into the dock. Done right, it looks simple but takes a lot of practice. And that practice is an investment in your seamanship. Once along side, secure with bow and stern lines and spring lines. Spring lines run diagonally either forward or aft. They are named for the direction they run and from their source: ie the after bow spring line runs aft from the bow and the forward quarter spring line runs forward from the stern of the boat. The longer the spring line, the better as it acts to snub any surging motion. Spring lines add increased stability to your mooring, ensuring the boat is securely held in place along side. Another type of line is a breast line. It runs from a cleat on the vessel directly to the dock at 90o. Breast lines can steady a vessel along the dock but will not prevent forward/backward surges in movement. Often, there is someone on dock offering to take a line. Before tossing the line to them, tell them exactly what you want them to do with it. You don't want your bow whipsawed around by someone who is enthusiastic but has no idea of what they are doing. If I am not certain about their ability, I politely decline. Rather than leave an untidy pile of line on the dock like any landlubber, finish it with a coil – called a Flemish Flake. Needless-to-say, every situation docking a boat is different. Wind is a major factor; in some places a current is running; other times, you may be in a very busy harbors. The most important thing is to practice. And the more you do, the more you will come to understand the feel of the various forces at work on your boat and how she behaves in different situations.